behead sb. 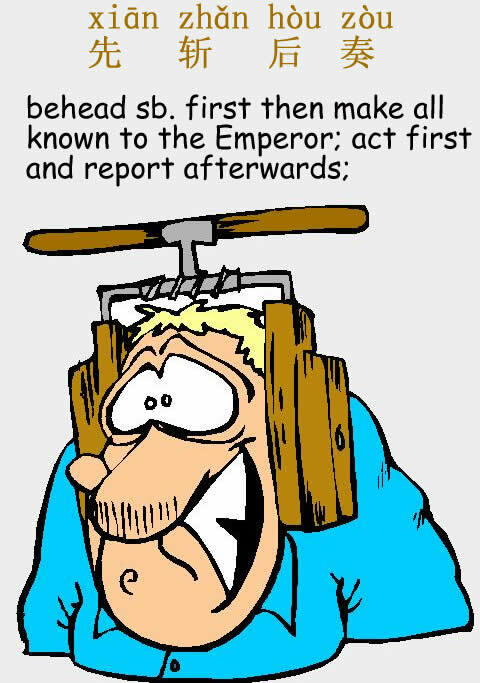 first then make all known to the Emperor; act first and report afterwards; execute one on the spot without prior approval from the court; kill sb. first then to report; slay the disobedient and report afterwards. Boyfriend said to me: "I didn't go to work yesterday,I went to see the dentist"
I replied: "Well then did you ask for leave to your company?" Boyfriend said: "I didn't,I called and asked for leave when I arrived the hospital"
I said: "Ah! You act first and report afterwards again!" I am learning Chinese these day, it's a wonderful language. These are the idioms which makes it tough sometimes to me. But your website is quite helpful to learn Chinese for me. I will say a big thanks of you guys. Keep it up.